Do I even really need to say why this movie did so well? 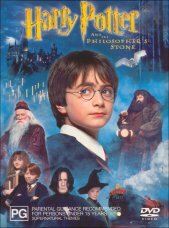 For those of you on another planet tuning in, Harry Potter is the star of this wonderful movie based on the books by J.K. Rowling. The story follows young Harry Potter as he attends his first year of school at Hogwarts for Wizards and Witches and the adventures that take place there. You see, magic is real and normal folk, called "muggles" just can't see it for the life of them. However, Harry is called to school to follow the legacy of his parents who died fighting the most evil wizard ever, Lord Voldemort, or as he is known, "He who must not be named". The movie is an absolute joy to view and some of the footage simply stunning, such as the quidditch match (sort of aerial lacrosse on broomsticks). Special effects are spectacular and the book has translated perfectly to the screen. Some DVD purists will complain that the movie has lost a bit of it's essence by the transfer to DVD as a pan and scan title as opposed to widescreen, but for the rest of us, this will not deter us in the slightest. Considering the target audience for the movie would be the younger viewers. That is one of the amazing things about the Harry Potter series. Written for children, however entertaining for adults as well, I found myself loving the series of books and then being blown away by how perfect everything was in the movie. Some have criticised director Chris Columbus for not taking any risks with the movie and having no vision. To those people, I say, get a life! The movie is exactly what any movie based on the book should be: an exact reproduction of the novel on the screen. And in the regard, the entire cast and crew have got it perfect. Harry Potter is a must add to your DVD collection, and for you purists, rumour has it that a widescreen version will be available in the future. Jam packed on two discs, Harry Potter will have you reliving the magic of the books once again. DVD rom content available for those with DVD rom drives on their computers.